Colin Matthews took over as the new chairman of the Highways Agency this month. He joins at a critical moment as the organisation reshapes from a government agency to a new Strategic Highways Company. Antony Oliver talks to him about the challenges ahead. Over the last six year Colin Matthews sat in the hot seat as chief executive of Heathrow while the business morphed, under direction from the Competition Commission, from giant airports monopoly BAA to a customer focused operation based around the world’s biggest hub airport. His new role as chairman of the Highways Agency clearly excites him, not least because government has committed to a long term investment plan to spend £24bn by 2021 on the nation’s major road network – a radical turnaround after years of piecemeal underfunding. Trunk roads and motorways are an integral part of the nation’s economy. Yet they face unprecedented challenge with traffic forecast to grow a whopping 46% by 2040. However, the planned restructure of the Agency into a customer focused private sector led business presents a major opportunity for Matthews to lead the transformation of this vast asset. The Department for Transport outlined plans to convert the Highways Agency into a new government-owned Strategic Highways Company (SHC) in June when it published a suite of draft documents detailing the key elements that will create “a cohesive and robust governance framework for the new company”. Critically, under this arrangement the new company will be granted a five year budget built to deliver against a newly agreed Roads Investment Strategy (RIS) which must now be developed by the end of the year ahead of a Spring launch of the new business. That means being more efficient and the goal is to shave £2.6bn off the cost of running the roads over ten years. But it also means setting the business up to cope with the future demands of travellers. And that means embracing technology, building resilience in the face of climate change and working out where the funding streams will come from. Government has committed to investing £24bn on national roads – a trebling of investment – by 2021. Is the Agency in shape to cope? Now is exactly the right moment to ensure that the organisation is in shape to spend that money efficiently. One of the key characteristics of the structural change that is going on is that we will be able to plan our investment over five years. Other industries have had five year plans for decades. You are obviously going to get better value for money if you can negotiate with your suppliers over a predictable flow of work across a reasonable period of time. British Airports Authority morphed from a public authority to a privatised customer-focused business. Will you take the Agency on a similar journey? It is categorically not about that. The roads are really important to the nation. They are a public asset and public owned and that is how I expect them to continue. What interests me is the operations and finding improvement – through new investment and in some cases through new technology. People in our organisation and elsewhere keep having ideas about making the network work better. That is my interest – no one has talked to me about ownership. But moving from infrastructure focus to customer focus is surely a critical part of your future plans? I think that it is an aspect. Thinking of users as individual people who want to know what is going on is something that customers expect and technology now makes that more practical today. People understand that things go wrong but they want to know that someone is doing their utmost to fix it. I hope that we will become an organisation that is better at communicating to individualds rather than treating everyone as statistic. Each journey – each driver – matters. 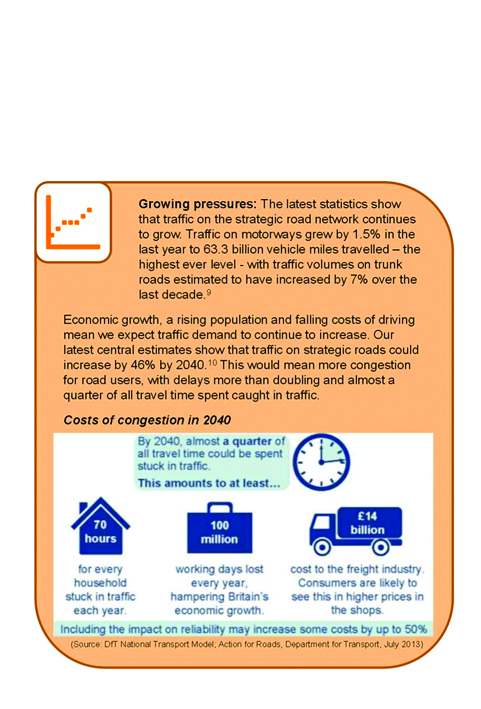 Traffic demand is estimated by the Department for Transport to rise by 46% by 2040 – how will we meet this target? 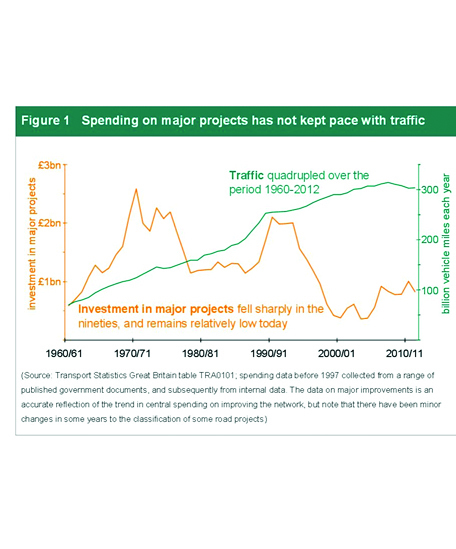 The investment programme over the coming years is not going to deliver loads of new roads. It is going to be about improving junctions and connections and bottlenecks and all of the things that I think frustrate drivers. You can’t do that overnight but progressively I hope users will be able to say that the network is getting better. At Heathrow you radically improved customer satisfaction. The Highways Agency now talks about roads users as customers? Is that important? I hope that is how we come to think of them. Historically the work of the Agency has not been tremendously visible and perhaps people take roads for granted. But I think that customers – drivers – will want to know more about what is going on and we are going to have to find better ways to tell them. If there is a hold-up we must be able to tell them accurately what it is, what is being done to fix it and how long it is going to take to clear. Certainly when I am driving those are the things that I want to know. Is tolling on your agenda to look at? It is not. As it happens personally I am not nearly as interested in all of those questions as I am in operational improvement – that is my job. The government owns the roads and it is up to them to decide the policy and how to run it. We will be looking to successive governments to be clear about that and as long as that is clear and stable it will put us in a good position to do a good job for the nation. Our job is to deliver. 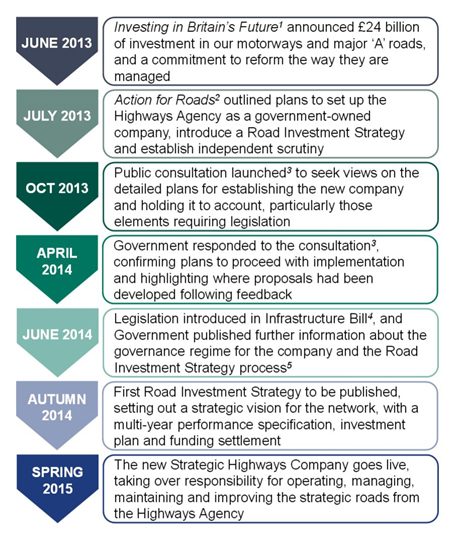 The Strategic Highways Company has to be set up ready to go by the end of the year – can that be achieved? My role is to make sure that the governance arrangements with the board work correctly and there is a lot to do. But don’t let’s get carried away – the really fundamental thing is to make the roads work better and if we successfully find ways to improve today’s network then that is the basis for everything else working. The first Road Investment Strategy has to be ready by the end of the year. Are there risks that this will be rushed? I wouldn’t put it that way. This is the first time we have done this so in subsequent years, of course, the routines mean that things will improve. But what I can say is that I am sure that, even in its first year it will be a better proposition than looking at it afresh each year. So of course it won’t be perfect first time around but it will be better than it has been in the past. An independent watchdog will be created to represent the interests of road users. Does that require changes in attitudes at the Agency? The public needs to have a means of knowing that we are doing a good job. So it is right that we have someone looking to see that we are efficient and that customer interests are being properly responded to. It is how other industries already operate so I don’t think its revolutionary but it is a big change for us. And if it causes us to find better ways of working then that is also good. Can civil servants move towards a private sector model? All organisations need to continue to up their game and to provide better services to customers for less money. The Highways Agency has fantastic strengths and its people really care about doing a good job. It has much to be proud of. But all of that is history – judge us now on how much we can improve in the present and the future. Will there be a need to bring in new skills? A new structure will mean that there are things that we haven’t done in the past that we will now have to do in the future. So there will be certain new skills for sure. Obviously with customer service and new technology I hope that we have our minds open to ideas from other people who run roads or other forms of transport. Stability for the supply chain is critical – do you agree? For a supplier to be really efficient then predictability is really important – they can build up their resources and capability because they will have a consistent relationship with us over five years. You won’t hear me talking in strident terms about one contracting model and that nothing else works. But you will see us focused on the best possible relationships with suppliers – commercially sharp with tension but with collaboration to ensure delivery. How will you create a sustainable highway network embracing new and emerging technologies and trends in climate and weather conditions. There are big challenges and motor manufacturers and others will be working on technologies that will increase efficiency and we need to make sure that we can exploit those. This is not a business as usual, static environment. But who knows where the technology will go? Is it going to be in the car, in gantries or in the road? I don’t know. But we need to make sure that we are up with the best ideas developing around how to make roads more efficient and carbon efficient. And finally…where is the next runway going to be built in the UK? I will leave you to debate that with others who are part of the industry. But it is worth saying that every journey, whether by rail or aeroplane, typically starts off with a road. So when we are planning our roads we need to make sure that it serves the country well by connecting well to rail and well to airports. We are interested in rail investment and in airport investment so that we can make sure that roads serve those other modes.